How fitting that Roi James is the steward (his word) of a 16th c. Italian Renaissance painting from the circle of Barocci. It was the Renaissance paintings that originally attracted Roi to painting in the first place. 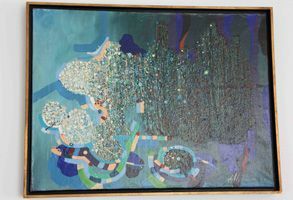 He started painting seriously at the age of 28 with oils. He had dabbled in watercolors with his mother, also a painter, at a young age and did quite a bit of drawing. He has become one of my favorite painters of any time period or any location on the planet. I wouldn’t mind at all if my home was a Roi James gallery. 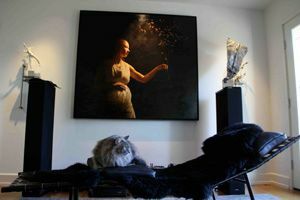 Roi was kind enough to share his favorite pieces in his collection in his home with me today. 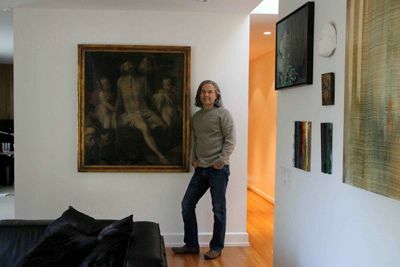 On his gallery wall in his living room, which he considers one large installation piece of his favorite things, the top piece on the left was his very first painting purchase in the early 1990s. A friend of his was an exchange student in Russia and came home with some pieces that he later sold and Roi was a lucky purchaser. 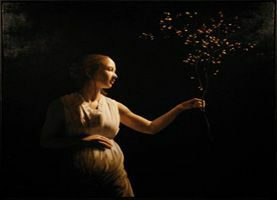 It is by Alexander Macholov and though he felt a little traumatized spending $400 on the purchase at the time it is still one of his favorite pieces today. 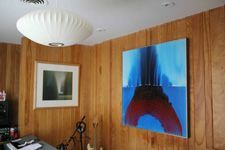 The painting on the bottom left is by Christopher Fitzgerald. Roi liked it so much that he commissioned him to do a larger one. This led Fitzgerald to do a series of about 30. 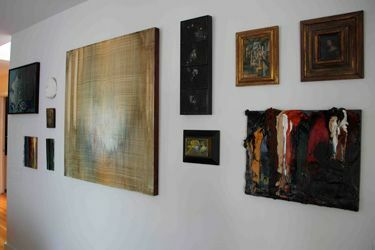 Roi ended up with one of the later in the series Old Masters Palette (far right). 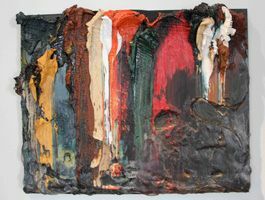 There is actually an artist’s palette underneath all those thick layers of paint! 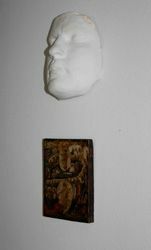 Next from top to bottom is a plaster cast of Roi’s face when he was 36, then a Russian icon, then a small construct Roi made. 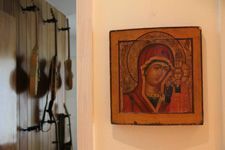 He has collected Russion icons for a while and has several more in the hallway. This one is Christ Descending. The center piece is Roi’s New Language which is appropriately named. 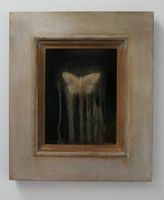 He hasn’t done anything quite like it since but it did lead to an incredible body of abstract work which was a big departure from his landcapes and figurative work and makes him a great modern painter. The next piece of map, silver leaf and iron wax (top) is by Sodalitas, a collaborative of three that work in a wide range of media. The four 5 x 7” pieces that comprise this were in totally parts of the room when Roi went to the 5 x 7 show one year. He grabbed two then went to another part of the room and grabbed two more. 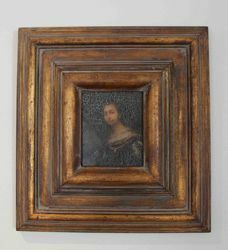 Sondalitas framed them together for him. Under the Sodalitas piece is a piece by Garcia Gasco . Roi thinks it is from the 1950s because of the frame. 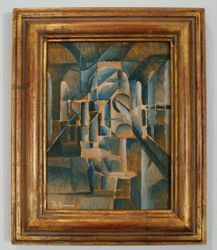 The cubist piece, Man in Cathedral is by Roi when he was experimenting with this period. The next piece he found at The City Wide Garage Sale. The sellers thought it was a decal but Roi took it outside and looked at it under a loop and found it was a painting. $100 well spent! In the music room (yes – he plays!) is a Will Klemm and another important artist, Ralph White. White was a professor at UT Austin and his Siftings in Oblivion from the 1970s was purchased posthumously – Roi did meet him before he died. The piece at the end of the hall is Journey of My Prayers so he can see his dreams and visions manifesting when gets up every morning. The butterfly, I Am Almost, greets him at the front door. Faith, Hope and Love (below) is across from his 16th Century Renaissance painting as a mirror of sorts. It is listed on his website and not marked with the red dot for "sold" but he is not sure he could ever part with it. 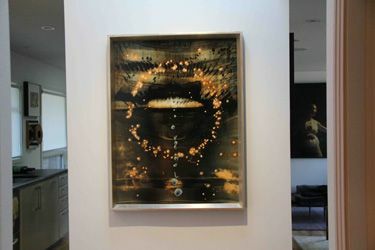 Roi has pieces by Lance Letscher, David Fullton and Vincent Mariani and many more. Thank you for sharing Roi!